Jesus be a lost password for Instagram please! These reality television stars continuously embarrass themselves when they do dumb ish like this. So Love & Hip Hop Hollywood's Amanda and her wonky eye thought it would be a good idea to get on her little Instagram account and go IN on Lil' Peen Fizz. You see, Amanda is upset because although Fizzy was practically begging for her to stop cheating on him so they could be a happy family, he now wants to flip the script and call her a thot. For the slow people/newbies, a thot is "that ho over there". Okay, so Fizz calls Amanda a thot, and she posts this message on Instagram. 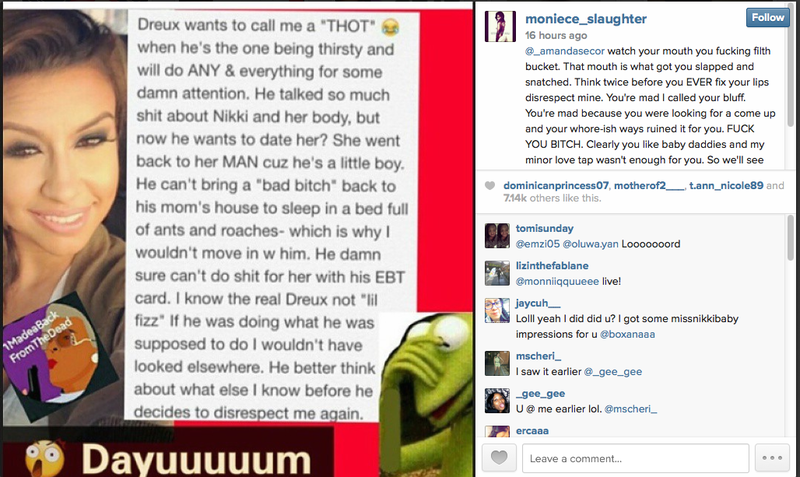 Fizz' baby mama, Moniece Slaughter, immediately put on her cape and came to his defense. I'm just gonna ignore the fact that Lil' Peen still lives with his mama, but is this dude trying to get his lady to sleep on roaches and ants?! Hayle naw! Somebody throw the yellow penalty flag! Lil Fizz has the game all the way effed up. He's running around town, begging every broad to play mommy to his kid when he still lives with his own mother lmao. This is too much. You know Moniece would pay money to be able to lay next to Fizz and his pet roaches and ants. She is obviously still in love with him because she goes hard for her man! Fizz' sister pretty much reiterated that Amanda is indeed a thot and she needs to leave her mother out of this beef. Um, sounds like someone needs to log off of Instagram and call an exterminator for their mom. Priorities people! What do you think of the Amanda vs. Moniece beef? Are you Team "Wonky Eye" or Team "Delusional Baby Mama"?